The cover artwork of the third CD by Endearment from Bielefeld doesn't look to promising, but after having listened to the opener Crash Kids (the CD also contains a video clip of that song), I knew my first impression was wrong. It's a very melodic pop punk song with strong melancholic elements. 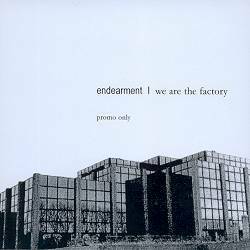 This already makes me guess that Endearment may be considered as an emo core band, although they are more varied in their work than what you hear in the opener. The melodic, even sometimes postrock sound appears on several tracks (Double Life, The City), although there is a angrier side of Endearment, too (Algebra, Committing Cultural Suicide, We Are The Factory). But don't expect Endearment to become truly aggressive. Especially the kind of guitar playing which often reminds me of The Cure doesn't let any room for brutal passages in the songs. The sound is very original and suitable for fans of indie pop and melodic emo punk. I also like Le Vin Rouge where Endearment are using a metallophone to add a very special sound. The vocals could sometimes be more developed, but apart from this little negative point, We Are The Factory underlines that Endearment really should be taken seriously.